The main event this weekend is the highly popular Medieval Market in Orihuela. With over 200 stalls and a packed program of daily entertainment, it is not to be missed!! This year Lent starts on the 1st March, so the flamboyant Carnivals will be held during the last weeks of February. The programmes for some are already available, make sure you check the Calendar of Events for each area to find Parade dates and times. The biggest Carnival is in Aguilas in the Costa Calida, it has been declared as being of International Tourist Interest and is well worth enjoying. The Medieval Market will be transporting the centre of Orihuela back in time on Friday, Saturday and Sunday. In Sax, the Moors and Christians will be parading and battling, and the annual Romeria in honour of Santa Agueda will take place in Catral. 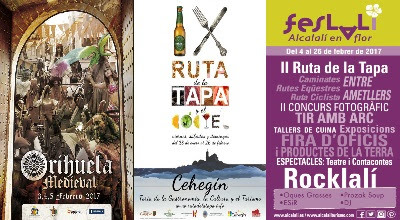 The Spoon Menus continue in Rojales during the week, and on Sunday the monthly Artists Market will be held at the Cuevas del Rodeo. In Torrevieja the Carnival Programme continues with the National Drag Queen Contest on Friday evening. The Almond Blossom Festival starts on Saturday in Alcalali, where there is the 2nd Tapas Route and daily Guided Visits of the Medieval Tower and the Ethnological Museum. The annual Crist de la Salut Fiesta starts in Altea La Vella, with an Exhibition of Classic Cars on Sunday morning, and the Ecological Market will take place in Jalon on Saturday morning, with this months theme being Trees.